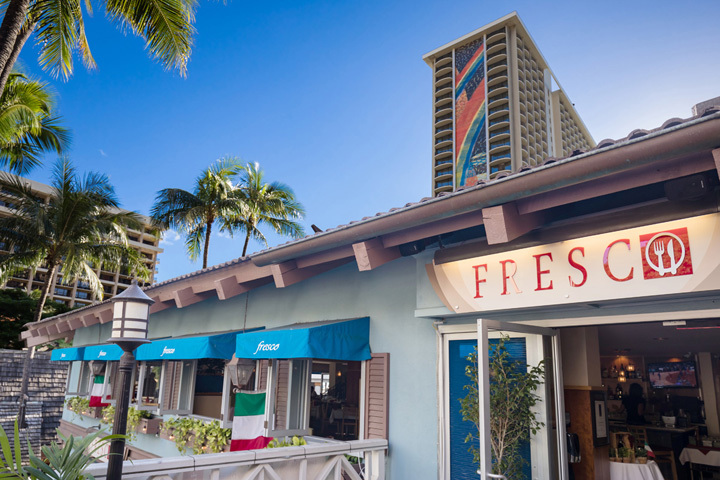 Join us on the edge of Waikiki for a sumptuous fusion of Italian cuisine and local flair in the midst of Hilton Hawaiian Village! Set for a natural intimacy that exudes the world-renowned spirit of Aloha, tables seat up to 172 guests in a contemporary design with wraparound windows and one VIP room, as well as two additional semi-private spaces and an open-air patio with views of the night sky. The menu concept was inspired by the North, Central and South region of Italy. Infusing the true Italian flavors from traditional three regions. The wine cellar stores popular selections, many of which are dedicated to Italian labels specifically designed to complement fresh seafood and steak entrees (and tantalizing desserts). Fresh in every way, it’s a dining experience not to be missed. Fresco Italian Restaurant was opened on June 3, 2012 Owned and operated by Blue Lagoon Investment Inc.
Complimentary Parking Validation for self-parking up to 4 hours. Menu and prices are subject to change.